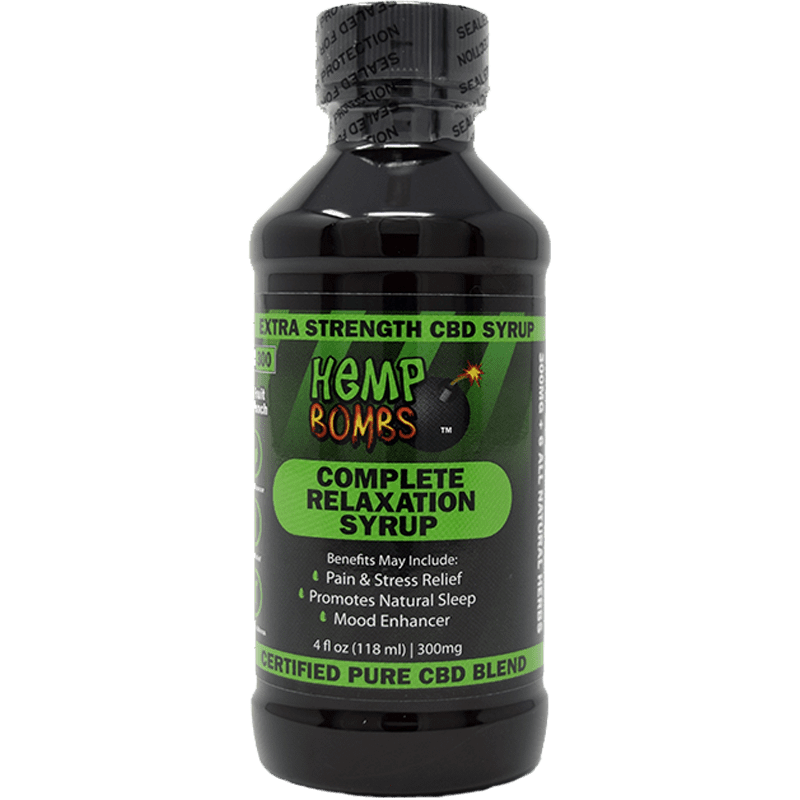 Hemp Bombs has proprietary rights to its CBD formula, meticulously crafting products for the consumer market. Experience the multitude of benefits of 5-count CBD Gummies today. Because CBD affects everyone differently, we recommend taking one or two gummies and seeing how you feel. We advise you to try CBD for the first time before bed – it can sometimes make people feel a bit sleepy due to its relaxing effects. Once you know how 5-count CBD Gummies make you feel, you may gradually increase your daily dose as needed. 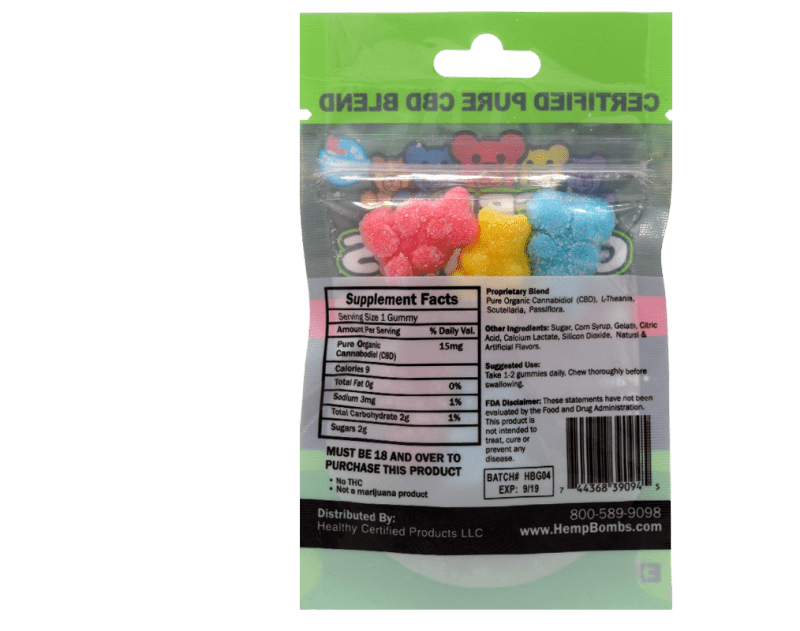 Hemp Bombs 5-count CBD Gummies are known to have a relaxing effect on both mind and body, and they’re a fun way to get a potent dosage of CBD. As we mentioned, CBD affects everyone differently, so you may feel sleepy after chewing a gummy – but our customers find them very effective. while at work my lower back started to hurt and I was given the product by a co-worker and I really didn’t think it would work but to my surprise 30 minute later I felt no pain. work the rest of the day pain free.I will continue to use the product as needed. Got them from the gas station down the road from me. Bought them for my grandpa. Im hoping they help him with pain from his hip and leg but he also has some auto immune disease so all the pills make him not have an appetite and nauseous so im hoping these will help him. Rating this 4 stars Because my friend just had hip surgery took one and his pain is almost completely gone and he is finally able to nap. Wonderful sleep aid. Put me right to sleep in my chair. I need this relief. Gonna buy more. I bought these at the gas station just up the rode. Not my first try of a CBD product and certainly not a regular user. I ate two gummies before I walked out the door and expected very little of an effect. About a half hour later I realized how potent the formula actually is. I won’t do more than a 3rd of a gummy and it works best if taken right before sleep. I’ll be buying a bottle of gummies very soon. They were good. Waiting for my paycheck at the end of the week. Bought a pack of these from a local gas station. I have been skeptical of CBD products for awhile, but have always wanted to try them. Took 1 and gave my wife 1, both felt mellow and relaxed after about 15 minutes. Hasn’t helped with my chronic pain yet, maybe I will try a higher dose. Great product. Felt immediate relaxation on these. I like them. I am a person diagnosed with general anxiety disorder and major depressive disorder. 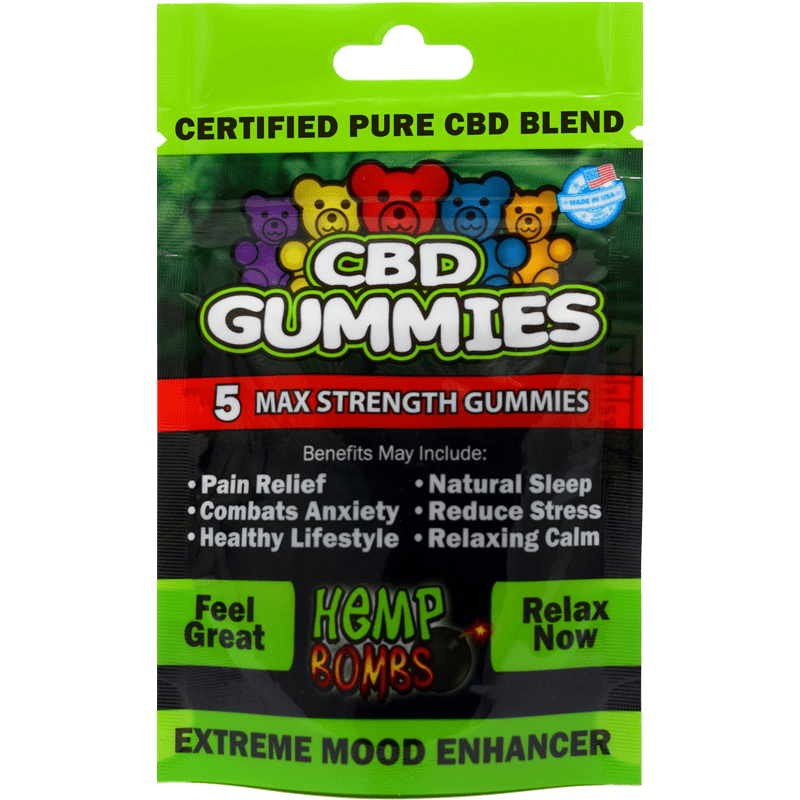 While I’m new to the CBD world, I have found these gummies to be fairly helpful, specifically with my anxiety. It’s not a cure nor does it provide complete relaxation, but these gummies definitely make me noticeably feel less mentally-busy and overwhelmed, which is good enough for me to continue using CBD products. I suggest these to anyone trying CBD out for the first time to counter their anxiety. Bought 5 as stocking stuffers for a Xmas party. Awful product. The gummies made me nauseous. Got from a local gas station. I got them to help calm me down during anxiety/panic attacks. It does that but it also knocks me out, like they make me SO tired. Like a long day and you can’t wait to go to sleep tired, hard to explain, you’ll have to try it yourself! These are delicious and work just as well as thw oil tincture! The taste reminds me of sour patch kids! They help me stay calm all day and not overthink things so badly. First time user. I recommend these highly for reduced anxiety and muscle relaxation. I have multiple autoimmune disorders including rheumatoid arthritis and fibromyalgia. I think I’ll buy a bottle and take 2 at a time instead of one. I’ll letyouknow how that works. I have high hopes. Thanks! My package arrived quick and the cbd gummies were relaxing. Picked up a packet of your gummies at a convenient store while on the road. The girl in front of me was buying them and I heard her talking to the cashier about them. They made me feel more relaxed. It seems like, as with many supplements, people’s body chemistries make a huge difference. Some of the lower-starred reviews here, for example, talk about seeking an obvious effect (when the verbiage here states it’s about removing feelings, not adding them) or say you can be fine with headache powder. Obviously not everyone’s body responds to that, which is why they’re here. As for me, the packaging is so frenetic and hyper and bizarrely colored that I wouldn’t normally feel comfortable buying it if people saw me do it, because it looks like it’s trying to sell synthetic weed to potheads. So why the five stars? I’ll be honest, I didn’t think it was going to do much of anything. If it did, it’d be placebo-ish, like I’d have to second-guess and interpret whether something was a product of taking the gummies or some other thing going on. The starts are because it does what it says unequivocally well. It says it is meant to relax, and it is relaxing. I do want to say, however, please please start low and work your way up as needed. I am not a large person but I am not a small person, and I started with two and it melted me into feeling the kind of relaxed you might get lying naked in the breeze on the top deck of a cruise ship. I also, the first night, had insane lucid dreams. The other nights, the dreams were vivid but not insane, but they are for me normally. The sleep was next level, though, in terms of waking up feeling restored. I also tried the capsules just for variety and they either were too much too quick or lasted too long; I basically lost that time to feeling wishy-washy. Again, that’s just me. It’s not the product’s fault that my body’s sensitive, I’m just putting it out there that that might be on the table for someone else. Keep in mind that with the gummiest at least, there’s other stuff in there you may be reacting to. In both cases (gummies and capsules) I tried a variety of circumstances (timing, with or without food, etc.) and the effects are reproducible. It is, in my opinion, for sure these products. And it blows my mind that they’re as powerful as they are. But, if you need that because you can’t get sleep or because you really suffer from pain and can’t get prescribed what you need? This is worth a shot. Save your money and buy some valerian root , melatonin ,and some goody powders. Not satisfied at all! My mom suffers from sciatica in her bones, and some days she couldn’t even get out of bed…. these gummy bears are like miracle workers. I’m not even joking. Within minutes, they took away her pain, and like totally relaxed her. She’s able to walk around again and not stay stuck in bed… I tried so many different oils, gummy bears, these are the only one she actually likes, and they actually work! I would absolutely recommend them to anyone!!! I received a free pack of gummies with an order of ejuice. I tried one gummy thinking nothing of it. I had a horrible reaction to the herbs they add into the gummy. These herbs made me dizzy, light headed, and gave me a pounding absurd headache that lasted 2 days. Be careful with these research the additives at the end of the ingredients list. Bought a five pack of these at a gas station last week and they’re great. Bright glares have given me headaches for years. After taken these, I don’t need my sunglasses to check my mail. It even helped my sciatic nerve pain. I’ve bought several bags since then. So this is a brand i hadn’t tried yet, I have chronic pelvic pain and decided to see if this brand would have more relief than others I’ve tried, it didn’t. Made me relax and sleepy but as far as pain tried there was none. They’re good if you have trouble sleeping or have anxiety but not so much for pain relief, for me anyway. Hands down, best tasting gummies. So thankful I found hemp bombs! I first purchased the gummies in the 5 pack of 15mg and started with just half of one in the evening because my anxiety peaks at night. I’m very sceptical about things like this so I wasn’t expecting anything from them (as I’ve tried green roads CBD oil) and nothing what so ever. Within 15 minutes I could already feel the anxiety start to back off, I also noticed that I didn’t have the pain in my shoulder which dislocates often from sports when I was younger. The best part was that within 25 minutes I had no anxiety at all, no pain, and I was feeling very relaxed. As much as you could spit in my face and I would tell you have a blessed day. 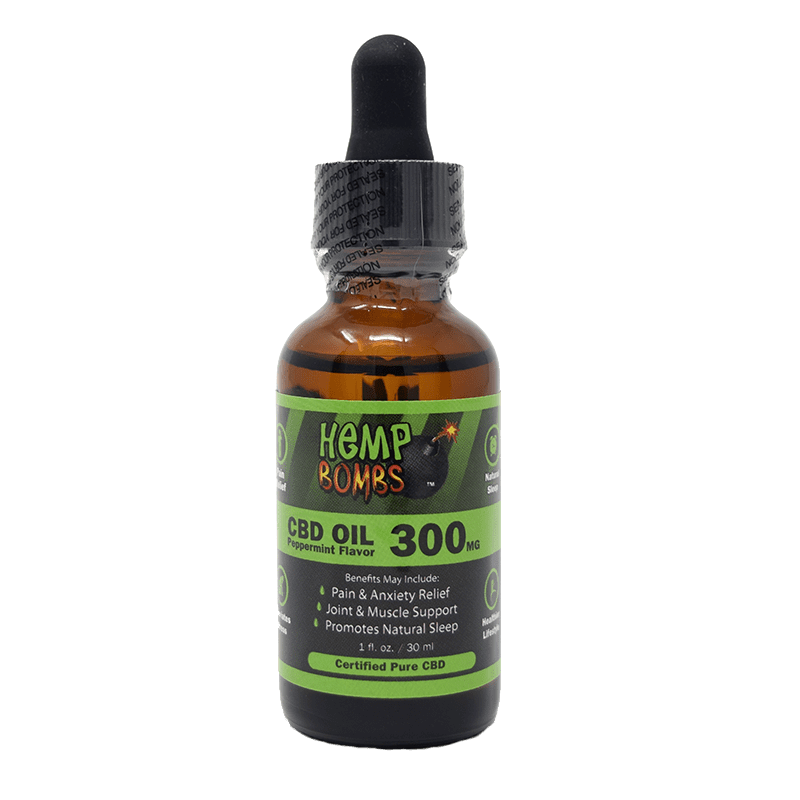 I then bought the CBD oil from hemp bombs and decided I’d try it because it may work different than the green roads, and YES it worked too and even faster. I have posted on my personal Facebook the pictures of my gummies and oil and have shared with my friends my experience with HEMP BOMBS. I’ll be a long time buyer as I hate taking the Valium the doctor has prescribed. 10 out of 10 from me. I don’t see how anyone could try this product line and not be satisfied. These are great very relaxing and calming. I will be purchasing again and spreading the word to friends. I bought the 5 pack the other day at a small convenience store. The gummies in the 5 pack were 10 mg. each. On your site the same identical -looking 5 pack had gummies that are 15 mg. each. I’m a newcomer so am wondering if the 10mg. is maybe an older version and now the 15mg. is the typical gummie in your 5 pack? I took 2 gummies one day and 3 gummies on the next day. I was disappointed that I didn’t notice any different feeling. Being a “type A” personality, I was hoping to feel a little less intense and stressed. It didn’t help with my joint and back pain either. Is a higher dose needed or am I one of those people that CBD doesn’t work for? They do however, have a pleasant taste! Thinking about getting these but I take drug tests regularly..has anybody taken these and successfully passed a drug test? I found these at the store across from my house, it’s a mom and pop shop. I’ve been looking for something that will help with my back pain from a motorcycle accident 2 yrs ago and these actually work! I can’t take medications because I work a full time job and other CBD stuff I’ve tried has THC in it so I get a “high” from it and can’t function correctly. It’s super important that I don’t have that feeling because I have 4 kids and HempBomb gummies actually give me just what I need without that “high” feeling. I’ve been in less pain over the last couple weeks and I’m actually able to do things with my family. THANK YOU HempBombs for amazing products!! 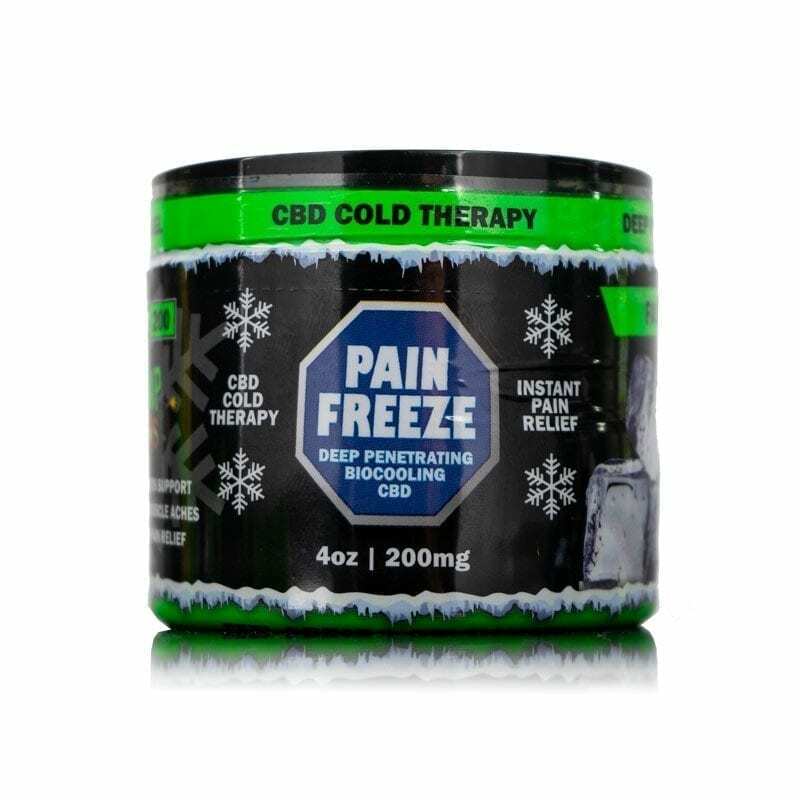 Got a 5pack of the cbd gummies at a gas station I have knee problems keeps me up w hen trying to sleep these took the pain all most completely away and helped me sleep thanks for an awsome product! I’ve only taken two and I already ordered the 60 count bottle! That’s how effective these gummies are for my anxiety. It’s like they calm my mind and thoughts and relax me. I’ve never experienced anything like it. Day 2 and I’m a fan. Gummies tasted delicious and worked like a charm!!! I got some of these from a local vape shop. I would definitely recommend. I took two and was good to go for several hours. Helped a lot with my anxiety and got some awesome sleep. Excellent alternative to other meds, prescribed or OTC. So, every morning I wake up with swollen gums from wisdom teeth, and can barely tolerate the pain. Doctors tell me to take Tylenol, which doesn’t work and harms the liver so I’ve basically been…out of luck. Well today my husband comes in with these he purchased at a head shop 🙂 I took 2, and there’s hardly any pain in my mouth at all! Honestly works better than narcotic pain killers imo. And I’m nice and relaxed! It’s time for a nap, actually. I really recommend for pain. 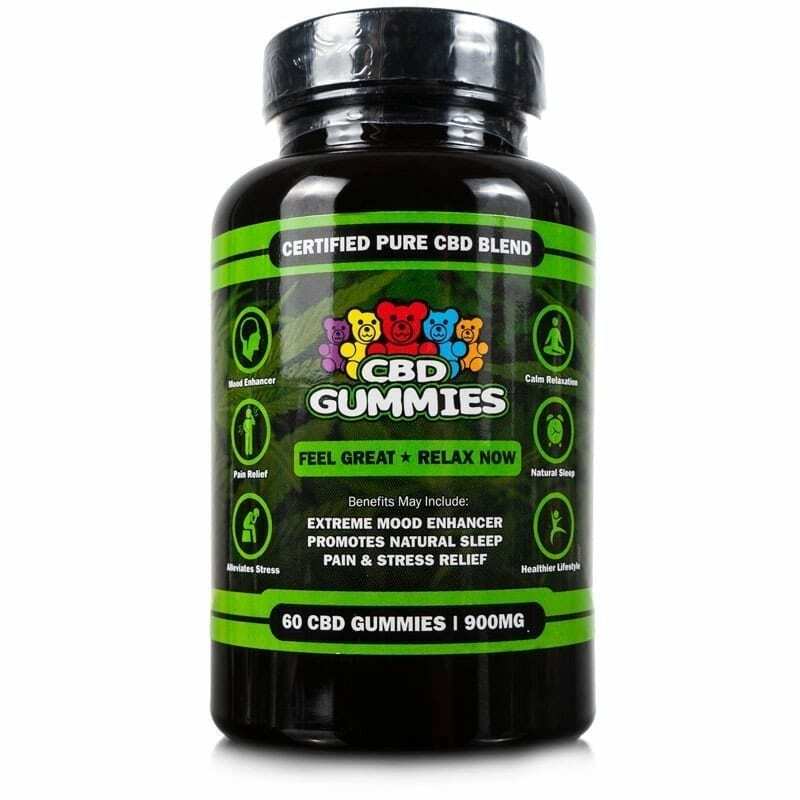 Found your site while doing a search for “best cbd gummies”. Based on the reviews I just placed an order. Hope they’re good. Price is a little high, but the cbd in it is good. A co worker gave me a couple of these gummys and now I am hooked. Delicious and relaxing. Gummies are great. Easy to stick in my pocket. These have to be the best tasting cbd gummies i have ever tried. I am a customer for life! I grabbed these at the counter while I was paying for some gum. Woah, I was surprised how well they work. Just placed an order for the 60 count bottle. For anyone who has panic attacks, this works great. It has helped me alot. I got the 5 count gummies as a part of the sample bundle and they were really yummy! These arrived in just two days. Thanks! I’d like to see other flavors of these. So delicious. I just can’t believe how well this works on my neck pain. I am a chronic pain patient and nothing I get from the doctor helps as much as this does. I am recommending this product to everyone I know that has chronic pain, diabetes, etc… It really works!!! We thoroughly enjoy the gummies and find them to be a delight after dinner before bed. Great product. These are great. I’m going to buy the bottle next. I’m new to Hemp Bombs. Just tried the 5-pack of Gummies I bought in a smoke shop here in Florida and really like them. These are ok. Didn’t feel too much. Taste is pleasant however. I love these CBD gummies. They are potent and tasty. I pop two before bed and after a few minutes I am ready for sleep. I love it. These really helped me for anxiety when I needed it. These gave me a mild mellow feeling. Expected more, but maybe that’s just what they do. These little treats helped me feel good and didn’t leave an after taste like others I’ve tried. I’m going to buy the bottle. Best money I ever spent at a gas station. Saw them at the counter and tried them out on a drive. Liked them. I got these while getting gas in Florida. Quite tasty and did relax the anxiety of driving. I just placed an order for a bottle. Thank you. Can’t say enough Hemp Bombs Gummies. I keep them in my purse for anytime CBD chewies. So I decided to go ahead try cbd gummies for my ra gotta say I was pleased first tried one then up two and was real happy with the results I was able to have New Years with family was able to move around and mingle with family will buy again . Passed out within 15 min and slept for 8 hours straight. I have mad insomnia normally. Really good stuff. CRPS patient and this stuff helps so much more than any pills I’ve ever taken. I thought these were gunna be amazing base off the reviews but I think they taste nasty and didn’t do anything for me. These little candies have saved my life! I love the all natural ingredients. So much easier on my frail system than other medicines that doctor wanted to give me. I tell everyone about Hemp Bombs and have converted many skeptical friends and family members. Keep helping people!! You guys are awesome. I’m impressed with the flavor of these. Grabbed a few different brands at the smokeshop last weekend and these are dynamite. The best tasting and most effective. Would give 5 stars if higher CBD was available. I use your capsules religiously and have nothing but good things to say about them.. I wanted to spice it up on my last order so I threw these in and used a discount code. They do taste good but didn’t do much. I recommend the capsules on an empty stomach over these. Started these to help manage my fibromyalgia pain and spinal pain from 4 different spinal fusions. I am happy to say that I am sleeping a lot better, and I rarely need to take any pain meds now. Also I was on 40 units of insulin daily and I am now down to 15 units and my blood sugar has good control. Must be the 1 gummy that I eat daily because I sure haven’t changed my diet. Works great for joint pain. I’m ordering a bigger supply. Gummy bears… bouncing here and there and….wait! Not these! They’re just mellow and relaxing! Lol!! Great product and now I’ll be buying these even more! These seem to lower my feelings of anxiety and depression. At my job it’s a really stressful environment with angry customers so I need something to unwind and take off the edge. CBD gummies seem to do the trick. Better than other hemp gummies out there. At least I feel something eating these. Others, not so much. A co-worker gave me a couple and I liked them. They do make me feel relaxed. I have gastro-intestinal issues (excess gas, bloating, stomach growing), for over 30 years, and tried everything under the sun with no long-term success. Very discouraging that I’ve missed out on the best things of life since the age of 16, because of the embarrassment of my stomach problems. 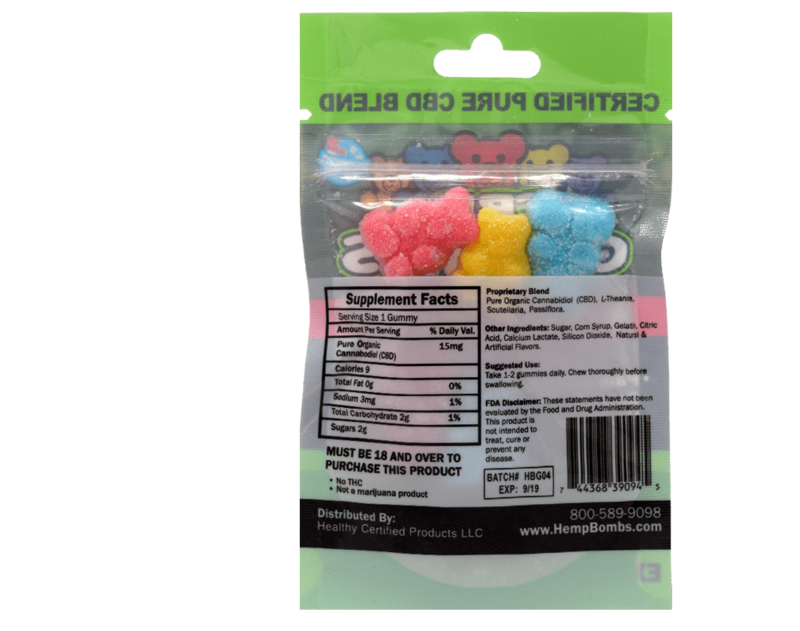 These gummies are the first thing I’ve ever tried with CDB…After eating 2 gummies, I felt more relaxed, and my gut felt a lot better. Still had a little bloating, and still some growling, but things feel a lot better and calmer (about 80 percent better) . I will be getting the bottle of 60, because I believe this may be my answer. I just hope my gut doesn’t become immune to the CBD after awhile, and goes back to the same problems. Thank you for creating this product! Came across your little gummies at a gas station and thought I’d give them a shot. Not bad. Cool logo too. Love your gummies. Would like larger pieces please. Just a note to let you know we eat the gummies before bed and we’re both falling asleep faster. Seems to relieve some of my back pain. Not a miracle pill tho. Was hoping for more. Tried taking just one gummie at a time and didn’t feel much. But two at a time works pretty good. Might try one of your other products with more mg of CBD next. Your CBD gummies work better than any other gummies we’ve tried. Got them at a convenient mart while filling up with gas on a trip. We’ll be getting the bottle next. I’ve tried a lot of CBD candy. These gummies taste great. Love your logo and packaging. Really eye catching. It’s what got me to try them out in the first place. Well low and behold they work. That mellow feeling give me is awesome. Good product. These are great. They help me sleep when I’m stressed out from work. I used to drink a glass of wine, but the calories caught up to me. Now I just chew a couple of gummies and I’m good.